I have been really busy participating at a lot of different Christmas Fairs the last weeks. 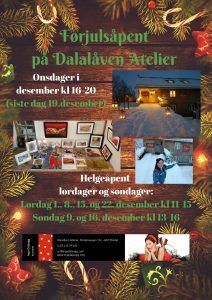 My last one this year will be Sunday 2nd December in Surnadal. As always I will have extended opening times in December here at my art studio Dalalåven, both evenings and weekends. I have a lot of different stuff, so here you can find presents for that person that “has everything”, but also sensible things you actually use, that are also decorated with art, and naturally enough, I also have original paintings. I also sell gift vouchers, these can be used on art merchandise, original art, and for workshops. If you just want to pop by to have a peek at my art that is also fine!